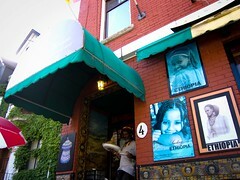 After my post on Ethiopian House, a friend mentioned that she was interested in trying out the cuisine. This was a great opportunity to try out Nazareth, which had been recommended to me by a regular blog reader. Atmosphere: The interior is busy. 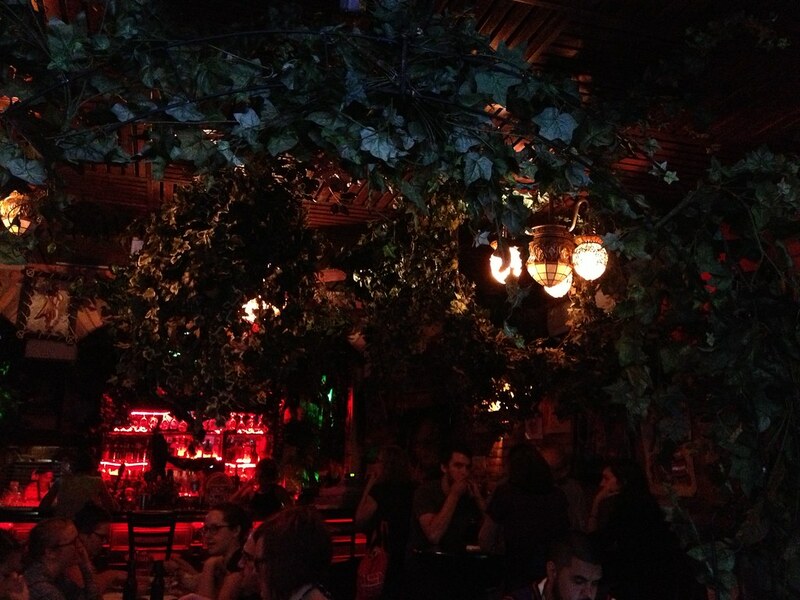 There’s a lot of hanging foliage decoration, dim lighting and little natural light. The space is also quite compact and has about 20-30 seatings by my estimate. We were lucky to sit by the front windows and had a nice secluded table. Otherwise you’re within elbow reach of your neighbours and it seemed like there was always a queue of new customers eyeing your spot. Service: I have to admit after reading reviews my expectations for service at Nazareth were fairly low and I wasn’t surprised. We didn’t have a bad experience by far but it was slightly below par. In general the feeling was one of indifference. I had been warned of long wait times, so two of us lined up early but their policy is to not seat without your full party. When we reached the front of the line, our last member was still parking. We were allowed to move aside and wait at the bar until she arrived and kept our place in line, which was great. Once we were seated, the wait time was long to get our order in and then longer for the food to arrive. It looked like there was only two servers working the dining area which included taking orders, bringing our dishes and clearing up. Food: Apologies for the low quality pictures, I forgot my camera and the restaurant was dark even at a window table. 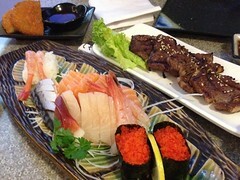 Prices are amazing with every dish being $10/$12 and filling enough for two people. We ordered the vegetarian combination and Kitfo. Originally we had wanted to try the chicken, but they were out for the day. I didn’t do my research before hand and did not expect the beef to be so rare (basically raw). 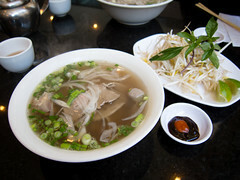 While I enjoyed the dish, the strong herbs and hint of sour taste, it isn’t to everyone’s palate. If you’re not a fan of steak tartar, Tibs (sauteed beef or veal in seasoned butter) is a far better option. Of the vegetarian selection, each dish was heavily seasoned and maintained the original texture of the chickpeas, lentils and cabbage. 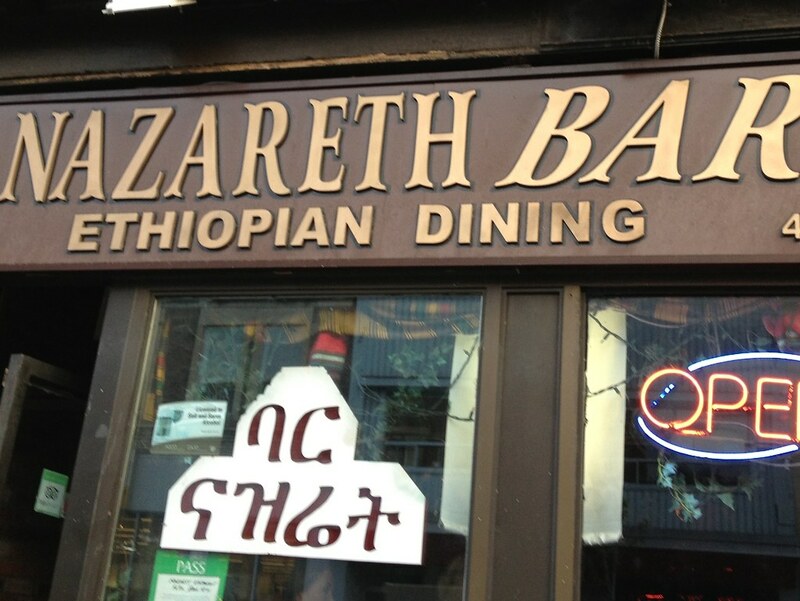 I would say relative to Ethiopian House, the flavours at Nazareth were stronger. 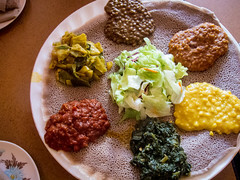 The topic of Ethiopian food came up recently at a friend’s place and the majority of people were inclined against the cuisine because they didn’t like injera. 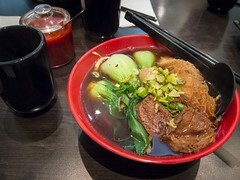 The combination of the sour flavour and spongy texture was not a crowd pleaser. It would be hard to enjoy the rest of the dishes if this was the case. Like trying Japanese and not liking sushi rice. One of the things I love about Toronto is the accessibility to international cuisine and I think everyone should take advantage of this. 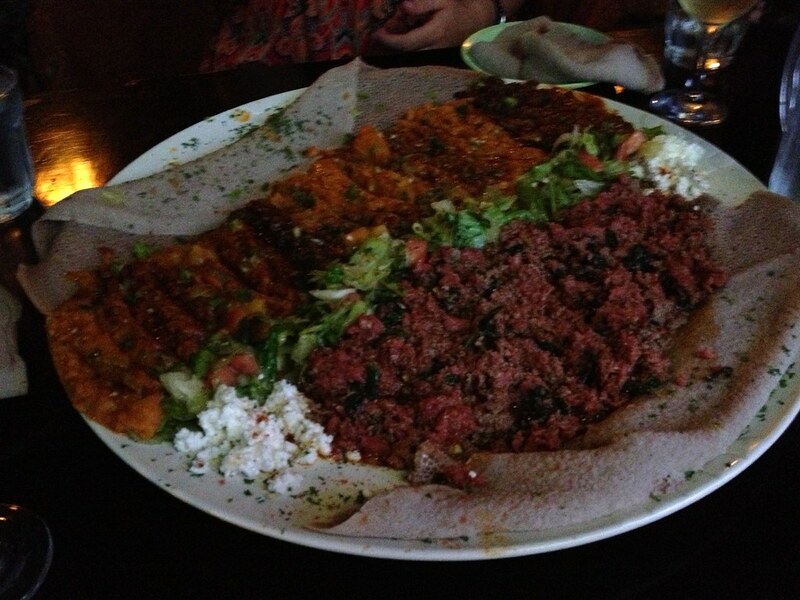 The possibility to try injera and see how your taste buds react is there and that’s pretty cool.